At the rear, a redesigned bumper reinforcement was developed that combines carbon fiber and aluminum to produce an equally strong, yet lighter (-500g) support piece. By bonding the carbon fiber to the extruded aluminum structure, the overall yield stress is increased while at the same time allowing the use of thinner aluminum. The carbon fiber section is produced in-house on the same production line that provided CFRP for the LFA supercar. Additional weight at the rear was taken out through the use of hollow half shafts in place of the previous solid shafts which shaves another 2 kg with no reduction in shaft strength. To capitalize on the reduced weight, the engineers also retuned the chassis with very precise changes that work together to give the car a more responsive feel. One example is the revised steering rack mounting bushings. In a typical high g load cornering situation, deflection of these bushings has the potential to throw off the toe settings of the front wheels and cause understeer. To reduce this effect, the engineers have increased the bushing stiffness by 150 per cent compared to the previous RC F, a change that improves both the initial steering response and overall road feel. Although it’s not part of the suspension, the rear engine mount was also redesigned to eliminate any sensation that the engine is “lagging behind” the chassis during aggressive changes in direction. The new mount actually reduces the stiffness of the rubber itself but increases the overall control through the use of a wider, more stable design. Boasting one of the last naturally aspirated V8s available in a luxury coupe, the RC F has a unique sound and feel that few of its competitors can replicate. Now rated at 472 horsepower (+5) at 7,100 rpm and 395 pound-feet of torque (+6) at 4,800 rpm, the 5.0-litre V8 (2UR-GSE) is a core element of the RC F’s personality. With that in mind, the engineering team focused on small, yet meaningful changes that add character and refinement without detracting from the visceral connection to the high revving V8. For the ultimate in standing start acceleration, the RC F now includes electronic launch control as standard that deliver an estimated 0-to-96 km/h time of just 4.2 seconds. With a push of the button on the console, the system automatically adjusts the traction and throttle control for maximum acceleration from a stop. All the driver has to do is press and hold the brake pedal, engage the system, floor the accelerator to bring up the engine speed and release the brake. Like the standard model, weight reduction was a key area of focus for the Track Edition. With a total curb weight of 1,715 kg, the Track Edition weighs 80 kg less than the previous RC F. Combined that with the 472 hp V8, and the Track Edition has the best power-to-weight ratio (3,63 kg/hp) in its class. With that goal in mind, every RC F Track Edition comes standard with Brembo® carbon ceramic brake rotors and six-piston Brembo calipers. The rotors are significantly lighter than their steel counterparts, contributing to a 22-kg total reduction in unsprung weight. Carbon ceramic rotors are also better able to withstand the extreme heat cycling associated with performance driving and their minimal wear characteristics result in less vibration at high speeds. Additional weight reduction was achieved with the switch to a set of ultra-lightweight 19” BBS forged alloy wheels. They feature a design derived from the RC F GT3 race car with a matte black finish and bright machined lip. A milling process is used to create the complex shape of the wheel spokes that helps to reduce the overall weight of each wheel by 0,7 kg compared to the standard wheels. A standard titanium muffler and connector pipes is yet another area where the Track Edition sheds weight. Rarely seen on production cars, the use of titanium sheds 7 kg from the rear of the Track Edition. This particular muffler is also tuned to deliver a linear sound over the entire rev range to take advantage of the unique acoustic characteristics of titanium. The exhaust tips are made from stainless steel but are coated in a blue finish for a unique look. The result is a CL reduction of 0.034 compared to the active spoiler, or up to 26 kg of downforce. At the same time, the shape of the wing smooths out the air over the back of the car which results in a 2 per cent reduction in drag. Combine the slippery shape and reduced weight with the standard launch control system and the RC F Track Edition is capable of delivering a 0-to-96 km/h time of 3.96 seconds. Top speed remains limited to 270 km/h. Only four exterior colors will be available: Ultra White, Atomic Silver, Caviar and Matte Nebula Grey, an exclusive color only available on the Track Edition. Standard RC F models are available in six colors: Ultra White, Atomic Silver, Caviar, Infrared, Flare Yellow and Ultrasonic Blue Mica 2.0. 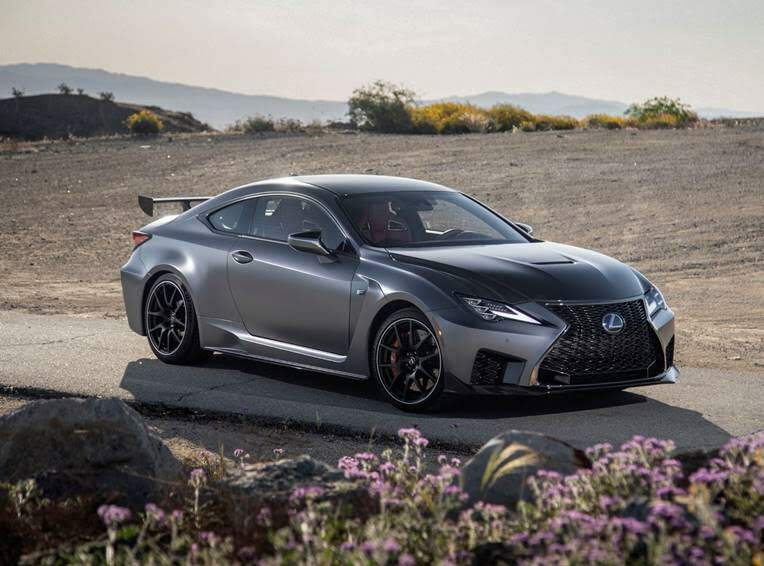 Both the 2020 Lexus RC F and the RC F Track Edition have started production and will be available at dealers soon. Pricing for the 2020 RC F starts at $85,000. The 2020 RC F Performance package starts at $96,000 and the 2020 RC F Track Edition starts at $119,950.